The JW Marriott Guanacaste Resort & Spa, located in Hacienda Pinilla, Guanacaste, offers the comfort of the modern world in combination with a solid position as one of the best resorts in Costa Rica, Central and South America. It combines colors, textures and key elements that identify the local heritage with a unique style called rustic luxury. Chosen by Travel+Leisure magazine in 2010 as one of the top ten hotels in the region, the resort has been also awarded by other magazines as World´s best resorts by Conde Nast (one of the most important publications in the world of the tourism industry); and one of the Top Five Spa's in Central & South America by Spa Magazine, a respected publication in the Spa industry. The resort has a perfect infrastructure and trained personal to handle all kind of events and theme parties. Beautiful gardens, patios, terraces and salons are ideal scenarios for guest to enjoy unique experiences and take memories that would lasts the lifetime. •LOCATION: Our beautiful resort is situated on a secluded beach, Mansita Beach which is awarded with the “Bandera Azul Ecológica”. This means that our beach is 100% pure and clean. •DESIGN: With our 310 luxuriously appointed guestrooms, including 20 One Bedroom Suites, we have already been labeled as one of the most exclusive and lush resorts in Latin America. •MEETING SPACE: We offer 7500 square feet of state of art indoor meeting space. Our outdoor function space thorough the resort includes Mansita Beach, our amazing Infinity Pool Area, Roof Gardens..etc •FLAVOURS: Our international experienced Executive Chef provides an exquisite cuisine in our 4 restaurants: Tamarine (Asian Fusion); Sabanero (Steak house), Azul Pool Grill (Mediterranean) and Mansita (International). •AMUSEMENT: It features a free flowing pool that covers 25.000 square feet of area providing a combination of private alcoves for couples and fun filled excitement for families. •RELAXATION: Our 20.000 square feet full service Spa includes 18 treatment rooms, beauty parlor, deluxe “palapas” for outdoor massages, sauna, steam room and high tech gym. •GOLF: An 18-hole championship golf course neighbors our hotel and features a challenging experience with breathtaking views of flourishing landscapes of the Pacific Ocean. It is the only golf course with the Audubon Society Certification in Costa Rica. Our Outdoor Pool opens 24 hours a day, never closes. It stars from the lobby all the way to the beach with an infinity edge. Ownership: Hotel Real de Pinilla S.A.
Buffet or a la carte available. Cost around $35 per person. 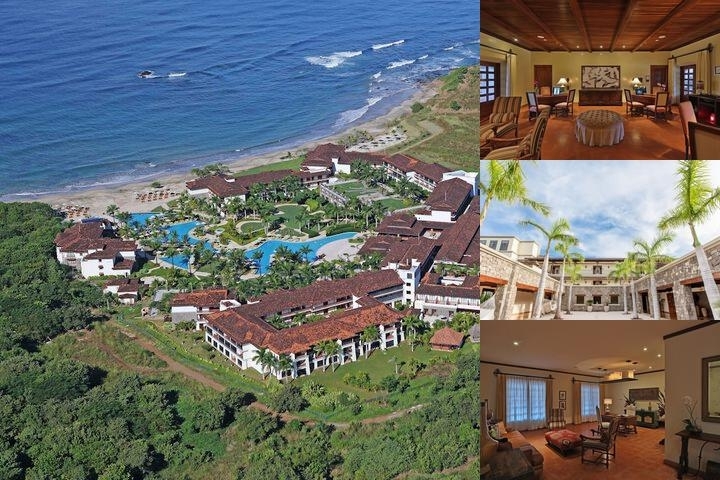 Below are the meeting, banquet, conference and event spaces at JW Marriott Guanacaste Resort & Spa. 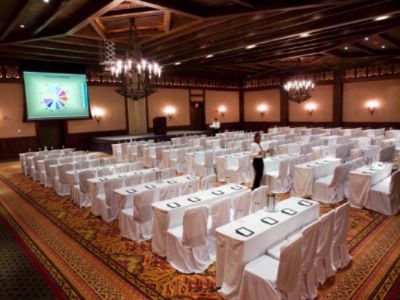 Feel free to use the JW Marriott Guanacaste Resort & Spa meeting space capacities chart below to help in your event planning. Hotel Planner specializes in Santa Cruz event planning for sleeping rooms and meeting space for corporate events, weddings, parties, conventions, negotiated rates and trade shows. 78 x 64 x 18 Ft.